In Florida, bicycles are legally defined as vehicles and cyclists are considered drivers. Since cyclists and those in motor vehicles have to share the road, they must follow the same rules. These laws include stopping for stop signs and red lights, riding with the flow of traffic, using lights at night, yielding the right-of-way when entering a roadway and yielding to pedestrians in crosswalks. In north central Florida cities such as Gainesville, bicycle traffic often outnumbers motor vehicle traffic on roads. Because of the increased amounts of bicyclists on the roads, there is more of a risk of accident and injury. Statistics show that the number of bicycle accidents is increasing yearly. In 2012, Florida had 6,425 bicycle crashes– a 28% increase from 2011. There were also more Florida cyclists injured in 2012. A whopping 6,058 cyclists were injured, almost a 31% increase from 2011. A surprising statistic is that only 11% of bicycle accidents involve a collision with a car. Of these car accidents however, 45% take place in intersections. The majority of bicycle accidents (59%) involve only the cyclist, who loses control of the bike and crashes. Laws requiring helmets exist in some areas, but cyclists over the age of 16 are not required to wear helmets when they ride. When cyclists choose to wear helmets, their chance of serious injury lessens drastically. Injuries from bicycle accidents– whether they involve motor vehicles, faulty roadways or rider error– can be severe and life altering. The most common injuries are nerve damage, broken or dislocated bones, and injuries to the neck, back, brain, or spinal cord. 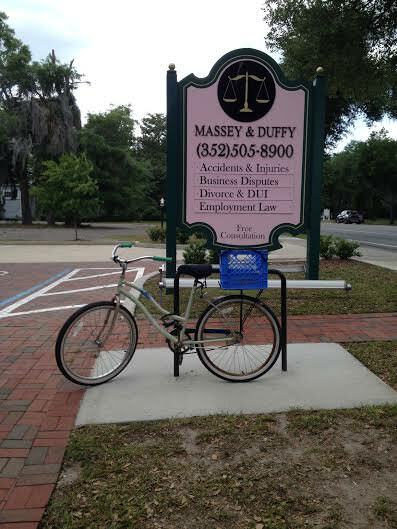 If you or a loved one have been involved in a bicycle crash, contact the experienced personal injury lawyers at Massey & Duffy, PLLC, for a free initial consultation. Our compassionate, professional lawyers will assist you quickly and appropriately.